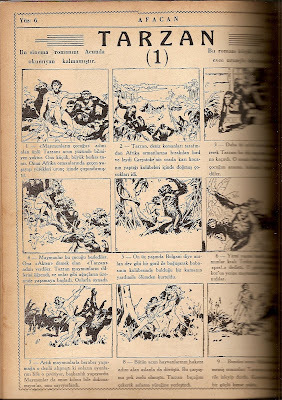 Tarzan comics, which were being serialized in the US newspapers since 1929, made their Turkish debut in b&w in the children's weekly magazine Afacan in 1935. Tarzan was first announced in the editor's page of no.9 as their upcoming new "sinema romanı" [cinema novel], a term frequently used in the era to denote comics which hadn't yet a fixed term to describe this new medium, and kicked off with no. 13 (dated Feb. 14th, 1935). Afacan alloted two full pages to Tarzan, the largest space given to any single comics in Turkey at the time (for instance, Jungle Jim, also being serialized there, had one full page). The first one-and-a-half pages of the first installement provided a quick summary background for Tarzan and then an adventure about elephants' graveyard began. This adventure is from US Sunday newspaper comics from 1932, at a time when Hal Foster had taken over the Sundays. However, the source material for the Turkish edition seems to be of French origin as Tarzan's friend in distress is named as "Jan Kursiye", rather than Erich von Harben as in the original US edition. It should also be noted that the b&w art is very 'clean', making one think that either b&w originals or b&w redrawings were used. Nevertheless, the Turkish serialization followed the US run, featuring the subsequent 'Egyptian saga' following the elephants' graveyard adventure, covering the whole run of Sundays from mid-1932 to early 1934. After the Egyptian saga ended, a new adventure started at no. 80., unfortunately with decreased, somewhat muddy-looking print quality as if b&w reproduction was struck directly from a color source. This new adventure is originally from US Sundays starting in early 1936, the last Tarzan adventure Foster had a hand in. In other words, the editors of Afacan had skipped (or had to skip, depending on material they had access to at the time) approximately two-years run of Sundays (the bulk of those adventures would later be presented to Turkish readers in a different format, as will be covered later in this blog). No further Tarzan comics would be published in Afacan until 1939. In the meantime, a sparsely illustrated text story titled 'Tarzan Kaçıyor [Tarzan Flees]' was serialized between no. 's 151-185. This was a Turkish translation of E.R.Burroughs novel Tarzan and the Lost Empire (1928). The illustrations are not from the daily strip adaptation serialized in US newspapers in 1930, but from a source I cannot identify. Tarzan comics returned to Afacan at no. 222 (dated Feb 16th, 1939) with the start of the serialization of 'Pars Adamlar [Leopard Men]' which ended at no. 257 (dated Oct. 20, 1939). This is indeed the daily strip adventure with the same title by Rex Maxon which had started in the US newspapers at the tail end of 1935. This would be the last Tarzan comics published in Afacan, which, despite already merging with the same publisher's Çocuk Sesi magazine at no. 251 and hence being retitled as Çocuk Sesi Afacan, would cease publication in 1940. Nice post.Turkish-translation or in any translation it would be a blast.Translating comics shows the rich blend of knowledge and culture in a society.It is important that literatures written in a foreign language since it helps one to get acquainted with the thoughts, traditions, principles and actions of the people from the region.